"These Icons are usually grotesquely distorted from the human form from which they derive. I decided to take a select few of these popular characters and render their skeletal systems as I imagine they might resemble if one truly had eye sockets half the size of its head, or fingerless-hands, or feet comprising 60% of its body mass." 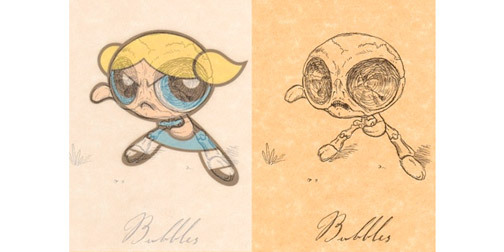 Buttercup, Bubbles and Blossom, you still look cute to me. (Found through Street Anatomy).